A man was killed when a tree fell on the vehicle he was driving in Carmarthenshire. Police were called to the B4306 between Pontyberem and Llannon after a large tree fell across the road and hit a van, just after 10:00 GMT. 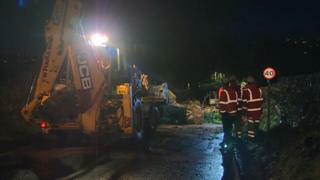 Mid and West Wales Fire Service confirmed the tree had fallen on to a Transit van. The driver was pronounced dead at the scene. Police have asked anyone with information to contact them on 101.